I remember finding these “Webisodes” online back when American Express launched this campaign in 2004. I love animation and I was a big Jerry Seinfeld fan, so it’s no surprise I’d like them. The pairing of Superman and the comedian actually began in 1998 when American Express aired the following commercial in January, 1998 during the NFL playoffs. The TV show Seinfeld had ended on top of the charts just the year before, so the timing of the commercial was perfect. As I said, in 2004 American Express launched their “Webisodes” campaign with a special Web site (defunct: jerry.americanexpress.com) featuring short animated/live action movies of the two promoting the credit card. Superman was played by Patrick Warburton, who played the David Puddy character on Seinfeld. The pieces were co-written by Seinfeld and Barry Levinson and directed by Levinson. The animation was done by the Canadian digital media firm, Unplugged Studio, using Flash technology. The campaign was launched with an awareness campaign featuring two fifteen second teaser ads aired on television to promote the Web site. 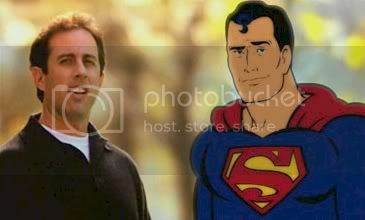 Both ads portrayed Superman trying to avoid answer phone calls from the Green Lantern, with Seinfeld covering for him. You can see them at Unplugged Studio’s site, in the animation section. The first “Webisode,” “A Uniform Used To Mean Something…” aired on May 13, 2004 durin the finale of NBC’s Fraiser and was seen by 25.4 million people. The Web site recorded four million visits per week during the first three weeks. This entry was posted on Tuesday, May 23rd, 2006 at 4:12 pm	and is filed under Animation, Comedy/Humor/Parody/Satire, Commercials/Advertisements. You can follow any responses to this entry through the RSS 2.0 feed. You can leave a response, or trackback from your own site. Hi – site isn’t working right. Rather than links to the Superman videos, all of them go to a Beastie Boys video. (?) Please help to put the original content back up. Thanks. Looks like the original videos were taken down and replaced, inexplicably, with Beastie Boys videos! I’ve found the original videos elsewhere and updated the page. Thanks for pointing it out.